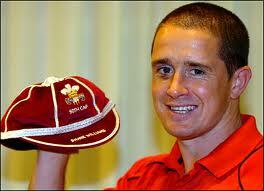 Shane Williams MBE born 26 February 1977 is a former Welsh rugby Union player most famous for his long and successful career as a wing for the Ospreys & the Wales national team. He can also play scrum half. Williams is the record try scorer for Wales, and is third on the international list of leading rugby Union test try scorers. He is Wales' most capped winger. Williams was selected as the IRB International player of the year in 2008. Since his retirement from international rugby in 2012, Williams has worked as a presenter on S4C Six Nations rugby programme Y Clwb Rygbi Rhyngwladol. 2013 The British and Irish Lions tour of Australia bought an unusaul call from Warren Gatland asking Shane to play one game to cover injuries so at the grand old age of 36 Shane put on the Lions shirt and played the game against The Brumbies sadly the Lions lost the game. Williams nearly scored a try in the first 2 minutes.